White Chocolate Bunny Ears: Electrelane. Bard College, May 2007. Electrelane. Bard College, May 2007. Emails sent ahead of time for directions went unheeded by the insular Bard students, so we asked about 10 people on campus where the concert was before we found the student union. The show, scheduled for 8pm, started a little after 10pm with a band that was supposed to be Tender Forever, but I don't think was. They were very good: cloudy streams of delayed guitar and electronics, minimal percussion and sparse vocals. But they only did 3 songs before The Blow came out, minus one of the Blowers, so it was kind of a solo show. The Blow has a loyal following at Bard, I assume, since half of the crowd was singing along. Khaela entertained us with geeky dance moves and quirky songs about, for example, how uncomfortable it is waking up after a one-night-stand next to someone with a really big head. Electrelane took the stage shortly after 11pm, and introduced us to songs from their new cd. Their playing was solid and artful, slowing down, speeding up, and extending into locked grooves of colorfully noisy walls of sound that would start and stop with subtle variations. Mia Clarke riffed on a Hagstrom, scraped the strings, and rubbed the fretboard against her Vox AC30, producing squealing feedback. Mia told me afterward that they usually play longer but they were not allowed to play at Bard after midnight. 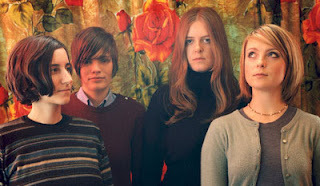 Electrelane are a must-see live, the sound they produce can't be replicated by any recording medium. Definitely worth staying out late on a Monday night to experience! Kylie Minogue. Showgirl Homecoming Live (2007). Sean Lennon. The Egg, Albany, April 10, 2007. Jonatha Brooke. The Egg, Albany, April 12, 2007.